I like this picture not as a clear id of the bird, but because of its Japanese ink-sketch quality. 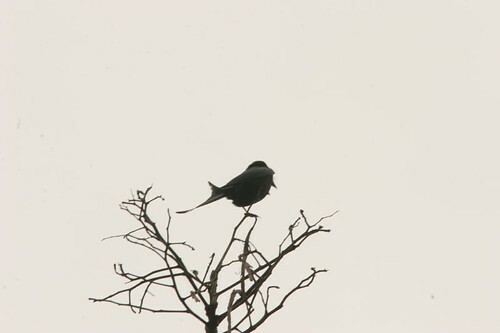 Mohan took it at Binsar..indeed, only the tail gives a clue as to the bird! What comes to mind as soon as one says the magic (especially to a housewife) words, “Eating out”? Lovely ambience, certainly, the smell of good food, definitely…but more than all these, I think of one thing in the restaurant that is an essential adjunct to a good meal….and that’s the menu card. Menus vary from a laminated sheet of paper (sometimes bearing traces of the actual dishes on it!) listing the dishes quite unemotionally, to .a fascinating, ornate piece of art. Very often, menu cards in the “better” restaurants resemble a photo album more than a menu card! Each dish is described in a veritable prose poem, and my rule of restaurant eating is: “The size of the bill is inversely proportional to the wattage of the lights…and directly proportional to the size, and weight, of the menu.” Effusions can really touch poetic heights. Who would not like to try ” gently simmered lentils and a combination of ground ethnic spices in a piquant tamarind sauce”…until one found out that what was being talked about was the humble “sambar”? Sometimes, though, it seems as if the menu has been written only for visiting foreigners, and not for the local population.I am particularly irked if I am sitting in Chennai and I am informed that parathas are “Indian unleavened bread”. “Sun-fermented South Indian rice pancakes”….humph, can you recognize the every-morning-smile-at-you idlis in that description? Another reason for fancy descriptions, I feel, is that the price factor can be bumped up quite a bit. Plain parathas cost perhaps ten rupees, but “Indian unleavened bread” would cost at least four times that! If my rasam is ” a combination of fragrant Indian herbs, spices and condiments in a tamarind sauce, tempered with mustard seeds in clarified butter” then I probably can’t afford it. I sometimes think they should have a separate menu for foreign tourists. I have yet to read, on any menu in Germany, a description of wurst as “German sausage”….or an explanation of meals in the UK like “Toad in the Hole”(imagine wanting to eat something with that name!). We go and take our chances there…why not let the foreigners discover our dishes for themselves, authentically, rather than have a huge menu card in a 5-star hotel with allegedly “authentic” (ironic…the word “authentic” on anything means it isn’t!) essays about the dish? In several restaurants, particularly in the US, I find that menus have gone “digital”…that is, we just order ” a main course of no.24 with a side order of no. 49.” Well…this is taking things to the other extreme, I think! I do love looking at the menu and sometimes, some names are huge sources of entertainment. Many years ago, Lake View Ice Cream Parlour on M G Road used to offer a “honeymoon special for four”. I like “Chainiaees” food, “fish fray”, “Cauliflower Manjuri”(Manchurian),and for dessert I could do with a “milk sweat”. I am most happy with what I call the “audio menu”, which consists of sitting at the table and asking the waiter when he appears “Bisiyaaga yenithey, swami?”(What’s hot, boss?) and hearing the litany of available dishes, and choosing what appeals to me at that moment…none of the fancy menus will offer me a lovely “baitu” ( which actually means, one cup divided by two ) coffee….or the crisp, terse menus written up on the walls of Darshinis. Now, of course, the word “menu” has spread to non-gastronomic environments too….but to me, it will always be associated, first and foremost, with food! Moving out of the parental home…. Many youngsters I know want to move out of their parental homes, for various reasons. For some the commute to work is becoming increasingly harder to bear; for others, the control of the family is too restrictive. Others simply find that their lifestyles differ so much from that of their parents that moving out would be a solution. I enjoyed this very much…. Just be sure that people who hear you making noises at your computer don’t get the wrong idea…they might not be far wrong, at that…. They didn’t hack this down because *I* hacked it and sent it in! Good to excavate articles and send the already dead bodies in for publication! I *DO* enjoy reaching out to people, and getting to know them. The few times that it has turned out not to be worth the effort is miniscule compared to all the times it is rewarding. Most people are, basically, decent human beings (*Cowers, waiting for the flak to descend*.) And I find people interesting…indeed, fascinating. And out of the numbers of acquaintances arise some close friendships….this, too, happens often enough for it to be worth the effort! This picture is about two years old…. Go to the centre of the picture until you come to a heading, Casa Ansal. That’s it! Can you see the swimming pool within the building? That smidgen going to and fro in the evenings is….me! Oh, well….see my home, in my most-beloved city! Want to see a superb photograph? You are currently browsing the Deponti to the world blog archives for June, 2006.